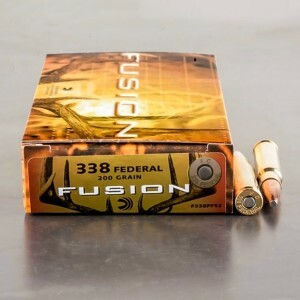 338 Federal ammo was originally released in 2006 as a powerful brush cartridge. The idea belonged to famed rifle man Jack O’Connor, but took decades to become a fleshed out production round. 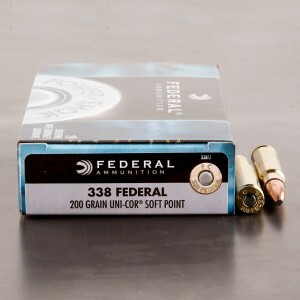 The 338 Federal is a non-magnum 338 round, it produces moderate recoil and a high velocity heavy payload. A 210 grain projectile can reach up to 2,630 feet per second of muzzle velocity with these rounds. The 338 Federal makes use of the standard 308 case, necked up to the larger, heavier, 33 caliber projectile. The round performs favorably against the standard .308, offering an additional 200 feet per second of muzzle velocity. The 338 federal is also designed to be loaded in lighter rifles, making them more capable for closer range bush hunting. The round has gained significant popularity for such a young round, enough so that Sako, Kimber, Tikka, and Ruger offered bolt action rifles. Several companies like Amalite and DPMS offered semi automatic rifles in the caliber, proposed as a hog hunting round.